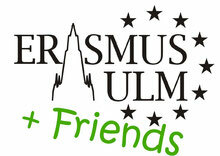 Erasmus Ulm + Friends - What does it stand for? We are a group of young and dedicated students offering various activities for exchange students to make their stay in Ulm more interesting. Our activities are not only for ERASMUS students, but open to everyone (the name exists only for historical reasons). We also welcome German students who are planning to go abroad, have come back from their exchange, or just want to get to know some nice people from all over the world. In addition, each semester we organize excursions to gorgeous destinations in the south of Germany and sometimes even further. We are also proud to welcome groups of exchange students from other universities to our greatly popular ERASMUS parties. Furthermore, you will find information on this website about all the other activities like going to the cinema, Christmas parties, ice-skating, swimming, bowling and whatever we think might be of interest to you. We try to offer all our activities at the lowest price possible in order not to exclude anyone. Of course the more participants we have for an event, the better it will be! All this is made possible through encouragement and financial support by the International Office of Ulm University and our Swabian way of dealing with money. Each and every Euro we get is used for our projects. Our work is voluntary and none of the money finds its way into our own pockets. If you have got any ideas for improvement or a new event you won't fall on deaf ears. New members are always welcome. We are a non-profit student organisation and we are not interested in lotteries and illegal bank transfers! And now have fun browsing our site!